← Daring Pairing: Barbeque Reds! Here’s a riddle for the wanna-be-a-connoisseur crowd: As Cabernet is to France, and Sangiovese is to Italy, what grape fills the bill for Spain? The answer, of course, is Tempranillo – the grape that puts the grit into the most highly regarded red wines of the region. Tempranillo has been revered for centuries as the main grape of Spanish Reds. Tempranillo is the true hero of Spain’s legendary Rioja wines and the mainstay of the cultishly popular wines of Ribera del Duero. This highly tannic, heavy-handed, heat-seeking grape even dares to follow in Don Quixote’s legendary footsteps on the sun-drenched plains of La Mancha. At its best, Tempranillo produces wines with subtle, beguiling aromas of strawberry, cherry, vanilla, leather, and spice; tannins that purr like velvet and flavors of “ripe fruit laid on a bed of earth and spice”. Until quite recently, Tempranillo really hadn’t been cultivated much outside of Spain. It shows up in a smattering of vines in the Midi and had a short-lived “nice try” in the Mendoza region of Argentina a few decades ago. Until now, the most success the grape has had outside of Spain has been a long-standing, undercover double-life in Portugal where it goes by the alias “Tinta Roriz” and gets rolled, namelessly, into the multi-grape Porto blend. Alas, despite being a hometown hero, Tempranillo never dreamed of international superstardom. At least not until 1998 in a little town named Bend, Texas. It was here that Jim and Karen Johnson, now the well-known proprietors of Alamosa Wine Cellars, first planted Tempranillo in Texas. Jim felt that Tempranillo would be well suited to the climate and soil conditions of his Texas Hill Country Vineyard, and the quality of the very ripe, broodishly dark, and highly tannic grapes from their first harvest in 1999 proved him correct. Karen and Jim, with help from Anthony King (now making Pinot Noir at Lemelson Winery inOregon) made a small batch of the 1999 Tempranillo and laid it down for a nice oak barrel nap. A few months later, stopping by Alamosa on his way out to study enology at U.C. Davis, Anthony tasted the rock-solid wine and said to Jim, “This is going to be a big handsome wine!” Thus, the name “El Guapo” was born, meaning “a handsome man” but with a wink and a nod to the Steve Martin movie “The Three Amigos” and its ugly bandito. This “handsome-yet-ugly” motif is the charming reason behind the picture of the horned lizard – no one’s idea of a natural beauty – on the label of wine called “El Guapo”. Following the Johnson’s trailblazing lead, several other Texas Wineries are now making Tempranillo. Dan and Rose Mary Gatlin of the Inwood Estates Winery in the Texas High Plains have been producing Tempranillo Blends (Tempranillo/Cabernet) since 2003. Dan Gatlin’s history in the Texas Wine Industry takes him back several generations, including the establishment of one of the first vineyards in the state in Denton County in 1981. This experimental vineyard sampled 22 all-vinifera varieties and brought the Gatlins to the same conclusion: Tempranillo does well in Texas! The Gatlins currently produce an Inwood Estates Tempranillo/Cabernet Blend that sells out almost before it is released, and a 100% Tempranillo named “Cornelious” in honor of Cornelious “Neal” Newsom who grows the grapes in his vineyard on the Texas High Plains. Another fan of Tempranillo in Texas, Gary McKibben of Red Caboose Winery and Vineyards in Meridian says he first tasted Tempranillo about ten years ago at a Mexican Restaurant in Dallas and fell instantly in love. Seven years ago, when he started his first vineyard, he planted Tempranillo as an experiment. Gary found it grew exceptionally well in his rocky vineyard, producing large clusters of dark, rich, highly tannic grapes. Gary first made a 100% Tempranillo wine in 2007, and reports his Tempranillo wines are very popular and he will be planting more vines, and producing more of his Tempranillo-based wine, in the future. Dr. Hellman goes on to state that his only concern about the future of Tempranillo inTexasis consumer acceptance of an unfamiliar variety. I can relate to this, as I know from experience that many consumers tend to stick to their Cabernet-Chardonnay-Merlot. So, here is the rallying cry: Come on, world, try a Tempranillo. The future of this noble grape is in your hands. Visit your local wine store, and beg for Texas Tempranillo to appear on the shelves. As of today, the following Texas Wineries are producing wines from Tempranillo: Alamosa Wine Cellars, Brushy Creek Winery, Haak Winery, Inwood Estates Winery, Lone Oak Winery, Red Caboose Winery, and San Martino Winery. Hopefully, there will be more in the future. 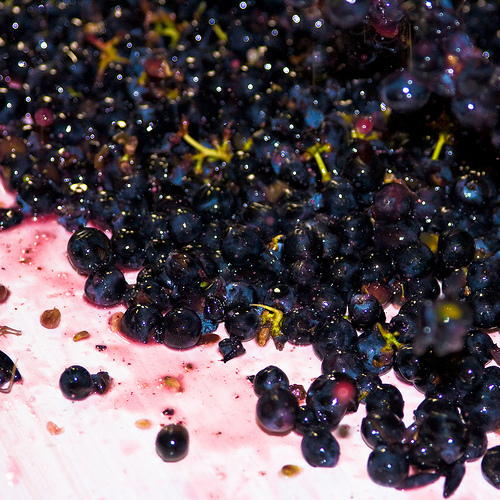 If you are a winery producing (or even considering producing) Tempranillo, let me know and I’ll help spread the word! Drink up, world, it’s Time for Tempranillo! Thanks for the terrific history lesson. Where do I find El Guapo?